Ubuntu 10.10 Maverick is out! 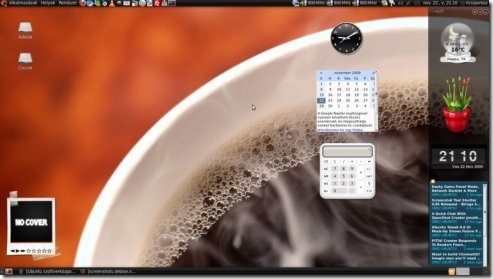 and if you want a charming and fancy GNOME desktop then Google gadgets will surely help you.Before going to our point first I am going to introduce you with Google Gadgets.In simple words Google Gadgets are mini objects developed in collaborative manner,and can be used to provide dynamic content to any web pages or to your desktop. It’s free to use and available for all platforms. To install Google Desktop Gadgets in Ubuntu 10.10 just search for ‘gadgets’ or ‘google gadgets’ in Ubuntu Software Center and select the package you want to install.By default you should choose GTK based unless you want to use Google gadgets on KDE desktop.Then click on the install button and wait for the installation to complete.It will hardly take a minute to complete. Where to find more cool Desktop Gadgets ? Download more cool gadgets from it’s official website.